them to write about them ! of Calgary Stampede and ·more. including 72 pages in full color. inches. Shpg. wt. 2 lbs. 14 oz. photographs by Walter D. Osborne. tween man and horse concisely told. man today. 82 pages. 6%:x9)4 in. Hardbound. 224 pages. 9%:x7 in. sister capture, tame two wild ponies. Black Gold. Story of Derby winner. cestor. 176 pages. 7.Ysx9%: inches. Marguetite Henry's All About Horses. Delu..'Ce edition. 30 full-color photos. boy becomes riding master. 112 pages. Sea Star, Orphan of Chincoteague. Sea Star. 172 pages. 7.Ysx9%: in. Mustang: Wild Spirit of the West. horses. 7.Ysx9%: in. 224 pages. champion jumper. 131 p. 67\!x93-1; in. racer. 326 pages. 6.Ysx9ji inches. tures, poetry. 342 pages. 57\!x8)4 in. World of Horses, An Anthology. M. C. Self. 384 pages. 6x9 inches. American Girl Book of Horse Stories. 10 tales. 183 pages. 5%:x87\! in. All Horses Go to Heaven. Anthology. 30 famous stories. 415 pages. 6x97\! in. Big Book of Favorite Horse Stories. courage, humor. 336 pgs. 6Ux9 in. riding are discussed. Fully illustrated. Winning Your Spun. By E.T. Moore. Care and training of horses. 124 pages. 8_%"x113'2 in. Sbpg. wt. 1 lb. 1 oz. wish to own a horse. 40 iUustrations. The Quarter Horse. R. W. Osborne. America's own breed. 100 photos. More than 128 pages. 7x10 inches. Eastern riding. 508 pgs. 6)4x97\! in. 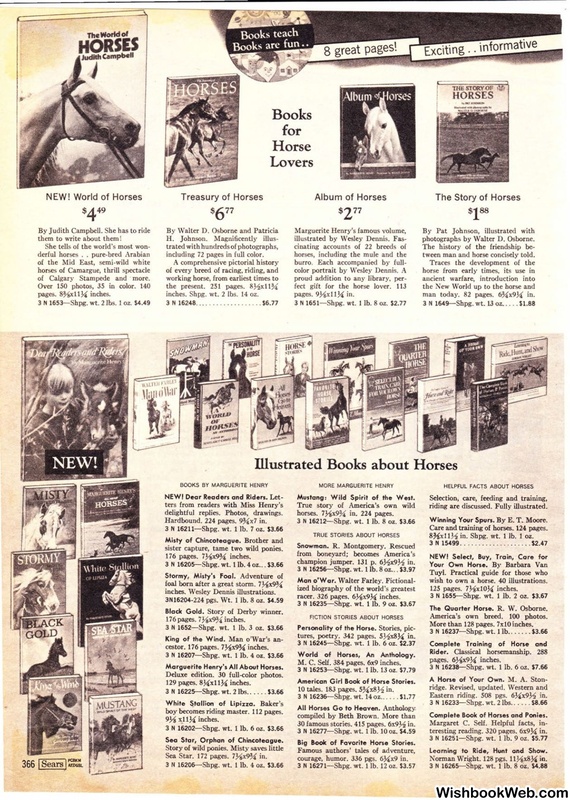 Complete Book of Horses and Ponies. teresting reading. 320 pages. 6x9ji in. 3 N16251-Shpg. wt. 1 lb. Norman Wright. 128 pgs. 11.Ysx8)4 in.